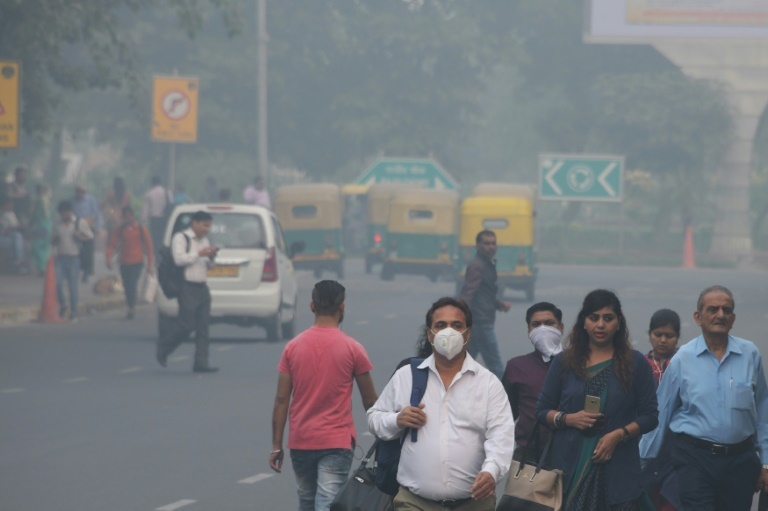 Smog kills more than one million Indians every year and Delhi has the worst air of any major city on the planet. 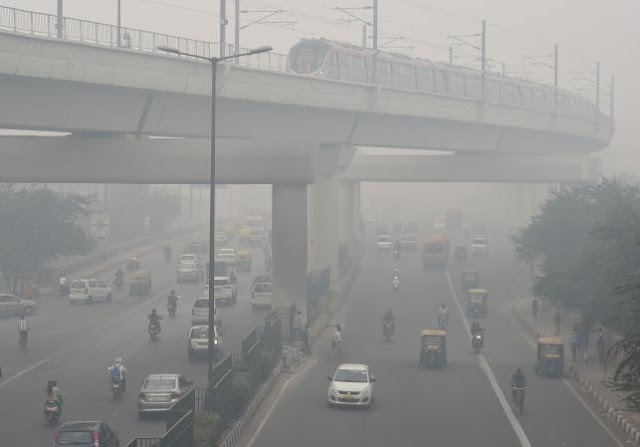 A Delhi Metro train (top) and vehicles drive past amids heavy smog in New Delhi on 5 November 2018. Photo: AFP Meta: Yogesh Kumar wheezes after life-saving surgery to remove a diseased lung, but his doctors wonder how long he can last outside hospital breathing some of the world’s dirtiest air. Yogesh Kumar wheezes after life-saving surgery to remove a diseased lung, but his doctors wonder how long he can last outside hospital breathing some of the world’s dirtiest air. Smog is blamed for the deaths of more than one million Indians every year and Delhi —which on Monday had emergency pollution levels more than 35 times the World Health Organization safe limit — has the worst air of any global capital. Every November, hospital wards fill with gasping patients as the tell-tale thick grey haze which hit on Monday shrouds the city of 20 million. “Delhi air is like a death sentence for him,” said Srinivas K. Gopinath, a thoracic surgeon at Sir Ganga Ram hospital in the Indian capital where 29-year-old Kumar was treated. Gopinath fears for his patient, who survived tuberculosis but is now at the mercy of another invisible killer. As cooler air traps pollutants close to the ground, Delhi’s levels of PM2.5 -- particles so tiny they can enter the lungs and bloodstream — soar dangerously. One of the worst times is around the Hindu festival of Diwali as smoke from millions of crackers set off by festive revellers mingles with car exhaust, factory emissions, construction dust and smoke from crop fires in nearby states. ‘Black lungs’ But Kumar is far from alone. Children, the elderly and those with respiratory ailments like asthma suffer the most from Delhi’s smog, which lingers until late February. Exposure to toxic air kills hundreds of thousands of children every year, the WHO said in an October report. Children breathe more rapidly than adults, taking twice as much polluted air into their tiny bodies. It has devastating effects on children in Delhi, say doctors. “A child who is born in Delhi is taking in gulps of bad air which is equivalent to smoking 20 to 25 cigarettes on the first day of his life,” said Arvind Kumar, a prominent Delhi lung surgeon. For years the surgeon has tirelessly campaigned to raise awareness about the dangers of air pollution, which the WHO last month likened to the tobacco epidemic. On hospital grounds this weekend Arvind Kumar ordered the installation of giant, artificial lungs fitted with filters to demonstrate the damaging effects of smog. Many of the patients he sees already bear physical scars from breathing a lifetime of Delhi air. “These are non-smokers, but even they have black lungs,” he told AFP. “Even teenagers have black spots on their lungs. This is frightening.” Despite Delhi’s smog reappearing every winter, official efforts to combat it have been ineffectual. Emergency measures such as banning construction, cutting down traffic and prohibiting the use of diesel generators have had little effect. More long-term solutions remain elusive. State governments have refused to cooperate on root causes of the crisis, such as farmers using fire to clear their land on the outskirts of Delhi. Surgeon Kumar said pollution needed to be tackled at its source. “Everything else is just eyewash,” he said.